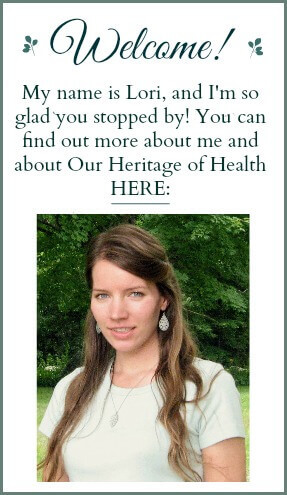 The more I learn about natural health, traditional foods, and old-fashioned living, the more I realize that people in our modern society keep getting further and further away from the idea of home health care. By home health care I mean treating minor health complaints with natural, homemade remedies rather than relying on over-the-counter drugstore medicines. What I’m talking about when I say home health care is the idea of using simple and natural homemade remedies to treat the little things, like a cold or a stomach ache. I’m talking about the importance of becoming more aware of our bodies and learning how to use the natural remedies in our own kitchens to help us to achieve the best health possible rather than immediately running out to the drugstore to buy something for every little complaint. There was a time in history when people placed much greater importance on learning how to use natural remedies to treat and prevent illness in themselves and in their families. Before the development of our modern medical system many people, especially those living in rural areas, needed to know the basics for treating illnesses and supporting the health and wellness of their bodies. Many people in past centuries kept manuals in their homes with advice for treating common health complaints. One example of this kind of manual is The Family Nurse, a book written by Lydia Marie Child and published in 1837. The Family Nurse is a companion book to The American Frugal Housewife. While The Family Nurse and other similar books were not intended to take the place of doctors, they were important resources a family could use to help themselves to take control of their own health. 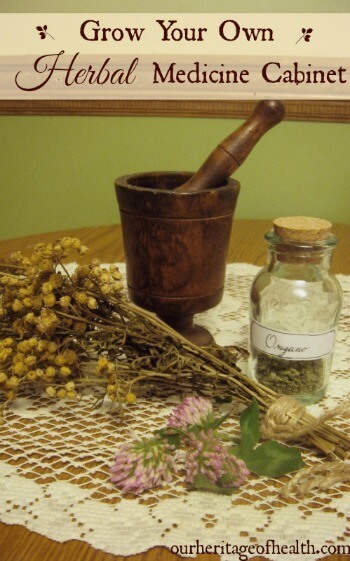 A major part of home health care historically has been the use of herbs in the treatment of health complaints. The Family Nurse devotes twenty-two pages to a list of various herbs and roots that can be used for medical treatment within the home. Herbs can often be very effective for restoring the body to health without as many of the unpleasant side affects associated with many modern drugs. In addition to helping treat illnesses, many herbs can also help us to prevent illnesses in the first place. Note: It’s important to use caution, of course, when trying any herbal remedy and to learn as much as possible about the herbs you are working with, but, generally, herbal remedies are usually safer and less likely to cause side effects than prescription drugs are, especially if those herbs are used in a culinary form. The amount of herbs you would use to make a cup of tea or to season soup wouldn’t be a very concentrated amount, so it would be less likely to create any side effects. Before I knew about herbal medicine, my first plan of attack whenever I was sick with a cold was to down a couple of drugstore cold remedy tablets along with a spoonful of that disgusting cherry-flavored cough medicine. Now, though, my plan of attack to fight against a cold would be to use food and herbs, like having some homemade soup with garlic and thyme and oregano, or making a cup of warm ginger tea. Homemade soup and ginger tea are definitely much more pleasant (and I think much more effective) cold remedies than those awful-tasting cold syrups and tablets. The idea of healing vs. masking symptoms was the thing that really drew me towards herbal medicine and holistic healing. While modern medicine has its benefits, it seems like a lot of modern medicine is focused only on trying to mask symptoms with a medicinal “band-aid” that often causes side-effect that are even worse than the original problem! Holistic healing, though, focuses on healing the whole body and bringing everything back into balance rather than just treating an isolated symptom. This makes so much more sense to me because I believe that God designed our bodies in a way that all of the different systems work in harmony with one another, and that restoring balance to the body’s systems allows the whole body to function more effectively. With holistic treatments, the goal is to take care of the original problem, not just to fix the symptoms of that problem. I’ve become really inspired lately to start learning more about the different types of herbs, about how to grow them and what their culinary and medicinal uses are. I started a small backyard herb garden last year with oregano, basil, thyme, rosemary, parsley, sage, lovage, and lavender. This year I added to it by planting lemon balm, spearmint, peppermint, borage, and chamomile. I’m looking forward to using the fresh herbs throughout the summer and then harvesting and drying the herbs at the end of the season. Part of what I love about herbs is the fact that they aren’t just good for your health – they taste amazing too! 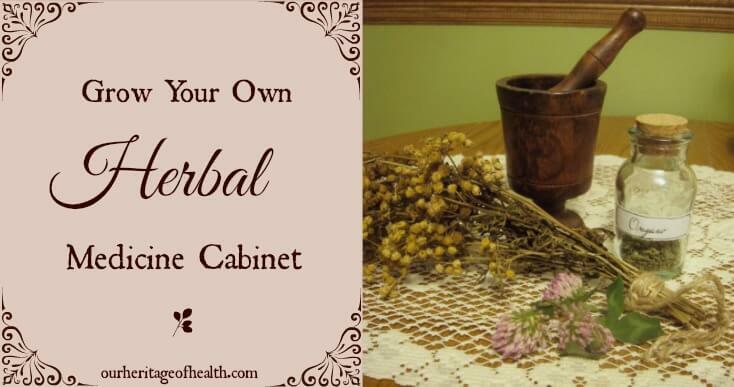 When you grow your own herbal medicine cabinet, you can use the herbs to enhance the flavor of your meals and be healthier at the same time. Whether you use herbs for brewing homemade teas or for seasoning your meals, there are so many delicious combinations of flavors that you can create. A great resource for learning more about the different types of herbs and ways to use them is The Herbal Kitchen: 50 Easy-to-Find Herbs and Over 250 Recipes to Bring Lasting Health to You and Your Family. This book, written Kami McBride tells you how to “discover the natural pharmacy in your kitchen cupboard.” I love that idea! And, what’s even better, the herbs you plant in your garden can do double duty. You can use them for treating illnesses and ailments, and you can also use them in cooking to flavor your meals. You definitely can’t do that with drugstore remedies . . . unless you want cough syrup flavored food, that is. Gross! I’m excited to learn as much as I can about the various types of herbs and about their healing properties so that I can use these old-fashioned resources in my journey toward optimal health! -Food first. Usually a soup with lots and lots of garlic, homemade chicken stock, kale, onion, etc. -Convetional medicine last (unless it’s something really obviously serious, which has only ever happened when I cut off the end of my thumb with a butcher knife!). I usually find the soup heals me/restores my health in a jiffy–works for stomach problems AND sinus issues, which seem to be the two things that happen to me when I do get sick–which is very rare, thankfully. Great post! I hope I can get that book from the library! I love my herb garden too. Also, my “medicine” cabinet is full of essential oils. I use medicinal teas a lot too, as well as herbal supplements. My boys are grown and we only went to the doctor a few times, plus one visit to a hospital for a nasty broken wrist. Oh yes, my oldest was born in the hospital too. I get excited about all that is provided in nature for our health and healing. Thank you for this blog. I’ll be checking in here again. Sounds like a great “medicine” cabinet – essential oils are awesome! And thanks for stopping by! I read above that you are planning on planting peppermint spearmint and lemon balm. May I advise a word of warning if you have never grown these before. These are very invasive!!! They will send out trailers under ground and a new plant will pop up even a few feet away (personal experience). These are wonderful herbs, I grow and use them regularly. Maybe plant one in a bucket mostly in the ground to try and keep them contained. Also might I suggest that you plant them in completely different areas of your yard so if they do decide to try and take over, they will not get tanged and you would need to smell the mints to see which is which (again – personal experience). I know you will enjoy your harvests. I also suggest harvesting and keeping them trimmed so they do not go into seed. Sometimes mine become a little bitter if I let them go into seed.